They focus on the reasons they dislike (or fear) marketing. Struggle with other people’s ideas and rules about marketing (that they hate or disagree with). Or see marketing as something you unfortunately must do if you want to be able to make enough money. What most people DON’T do, however, is come up with their own definition of marketing, and what it could be OTHER THAN a necessary (or unfortunate) part of doing business. Because marketing doesn’t have to be a struggle. And it doesn’t have to be something that feels like a should instead of something you want to do. 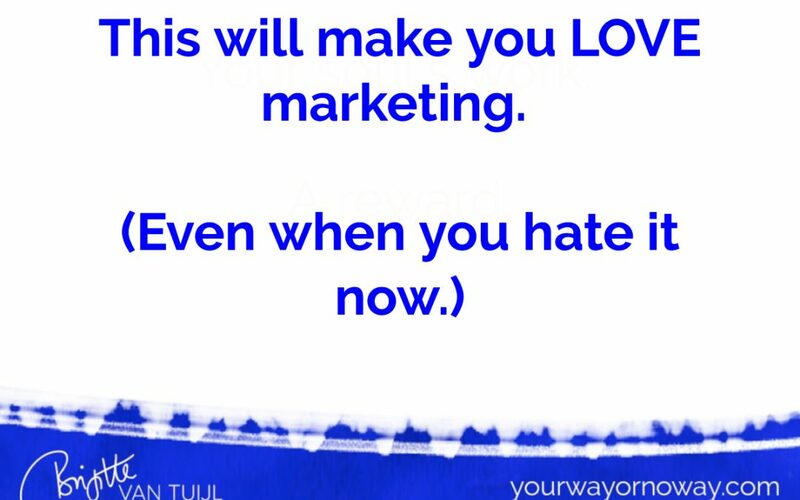 There is ALWAYS a way to look at marketing that makes you WANT to do (more of) it! Because marketing = what YOU decide it is. YOU choose your perspective on marketing – and your marketing can contribute to whatever you want it to contribute to. As long as I saw marketing as a necessary evil, I absolutely loathed it – it was a source of ongoing stress and a drain on my energy for years! Until I changed my mind about marketing. Reminded myself that I AM THE BOSS of my business and life – and I decide what I do, how I do it, why I do it, and what meaning I give it. And came up with a pretty cool list of things my marketing contributes to. Here are some things I came up with that made me feel excited about marketing, and actually made me LOVE it. Let it inspire you to come up with your OWN view on marketing and what YOU want it to contribute to. By noticing which fears, insecurities & doubts it triggers, and transform and shift those. By sharing information and/or energy that helps others heal. Like writing. Or speaking. Or making videos. Be a way to share joy, love and beauty with others. By sharing messages of beauty, joy and love. By sharing your personal experiences. And writing about things you believe in and stand for. By finding different words to share your message. Or different ways to reach your audience. By sharing valuable content that inspires them, empowers them, or teaches them something. Be a way to help raise the frequency of & heal the planet. What if you infuse ALLLLL of your marketing, promotions and campaigns with LOVE and HEALING ENERGY? That way, your MARKETING helps spread more love, joy & light throughout the world!!! What makes marketing exciting and worthwhile for YOU? What makes it fun, joyful, fulfilling and meaningful? What motivates YOU to do (more) marketing – or do it in different ways that feel GOOD to you? And how can your marketing help you fulfill your purpose? Whatever excites you and makes you feel good, goes on your list! Marketing = what YOU DECIDE it is. Choose a perspective that makes you feel GOOD, and you’ll feel better about marketing immediately – AND get better results from it, too! You call the shots in your business, your life AND your marketing. be true to you in everything you do – including your marketing. P.S. : Ready to learn exactly how to shift into a marketing mindset that helps you love it AND do marketing 100% in YOUR own way? So it never stresses you out or make you want to avoid it anymore? And it helps you build and grow the business of your dreams?